The SuperPRO II Gun has no needle. No seats. MVP’s superior design integrates a single roll pin design that gives a consistent edge over the competition along with fewer parts. SuperPRO II is one of the most versatile guns for use in the FRP industry. Tools are meant to be an extension of the human hand. The SuperPRO II Gun has an ergonomic handle designed specifically for gun user’s comfort. 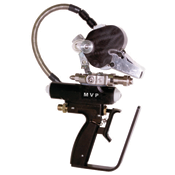 Low pressure and low emissions make the SuperPRO II Gun the gun of choice for thousands of FRP operator’s.